Shaz by the Sea: ¡Feliz año nuevo a todos! Jim and I hosted a small party on NYE. 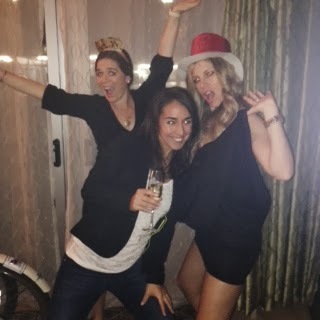 We had about 10 people over and it was a fun time ringing in the new year with great friends, like these lovely ladies. 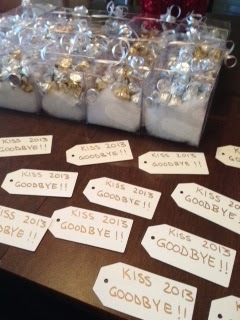 In preparation of our NYE party, I wanted to make some fun edible party favors. I immediately logged into Pinterest and looked up a few options. 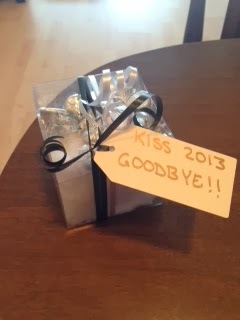 I found the cutest little clear boxes with Hershey kisses that read "Kiss 2013 Goodbye!" I used that idea and then added a few personal touches. I ordered everything on Amazon Prime and it arrived within a few days. I was so excited to get started! 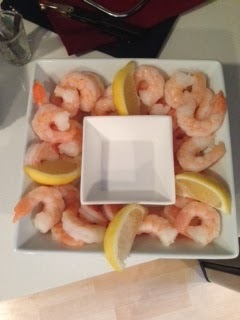 I find that hosting a NYE party is tough because you don't know whether to serve dinner or late night apps and treats. You don't want your guests to be too hammered, but at the same time you also don't want to spend the entire day cooking/prepping/setting the table all while planning a late night party. It's almost like planning two parties in one (while pregnant with twins and working full time). Since it was a small group and people weren't arriving until later in the evening, I opted for a few late night apps. 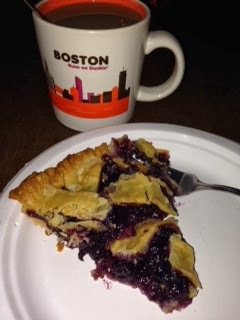 Lastly, I made a homemade blueberry pie that Rocko thought was for decoration only. Haha. I must emphasize the use of cornstarch vs flour in this recipe, as well as adding a bit of lemon zest. 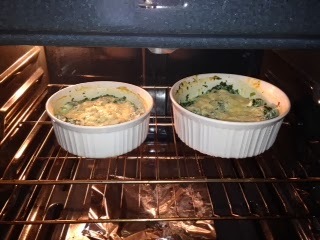 I think it adds wonders to the recipe. We also served a store bought cheesecake at the party. Here's a breakdown on how to make the awesome bruschetta. 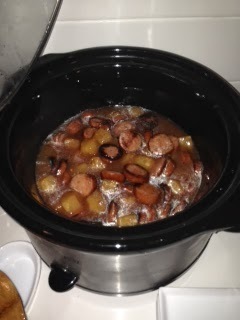 Kiley introduced me to this recipe about a year or so ago and it's so yummy! Definitely a must-have for entertaining...and a great vegetarian option for your guests. Start with any french bread loaf at your local bakery. It is best if it is a day or so old. 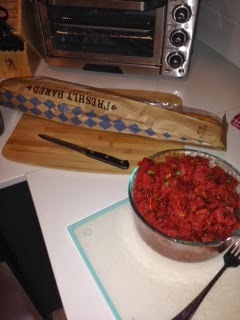 For one loaf of bread, I would suggest about 3 medium sized cans of diced tomatoes. I like to use the ones that have "garlic, basil and oregano" for a little extra flavor. It is imperative that you drain your diced tomatoes in a strainer for about 4-6 hours (sometimes I even do it overnight covered in plastic wrap) to make sure all the moisture is out. 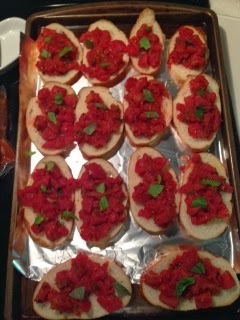 No one wants soggy bruschetta! Keep adding salt and/or garlic salt throughout the draining process to draw out the moisture, all while they remain in the strainer, over a large bowl. Please remember to drain the bowl occasionally...it will become full, FAST! Add a small amount of EVOO to each slice of bread, if you have a pastry brush then I suggest using that to spread the oil around each slice. After that, add your tomatoes and a little fresh basil, fresh ground pepper - whatever your taste buds desire, similar to the photo below. 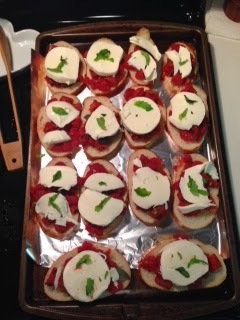 Slice up your mozz cheese and add however much you like to each piece of bruschetta. If you don't want cheese, don't add it! 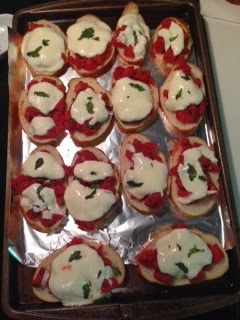 I usually have leftover basil, so I add another layer to the pieces of bruschetta. I love basil. 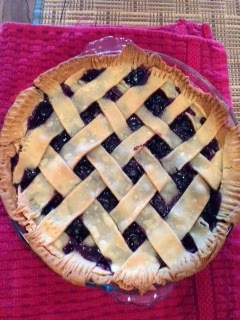 I tyically bake it at 350 degrees for about 12-15 minutes. 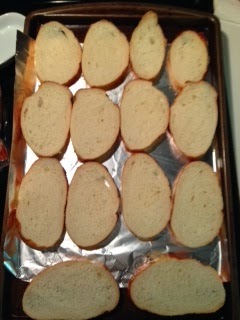 I sometimes toss the broiler on at the end to make the tops of the bruschetta brown and a tiny bit crispy. But you have to watch them like a hawk or they can burn really quickly. And here is how I spent my New Years Day...post party house cleaning, of course. 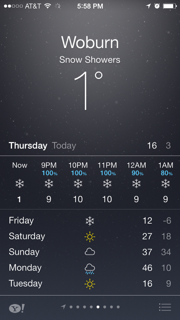 It looks like it was a bit chilly back home. Hope you all enjoy 2014! Big year ahead! HOLY MOLY IT'S COLD IN WOBURN! Loved the evening, love this post!